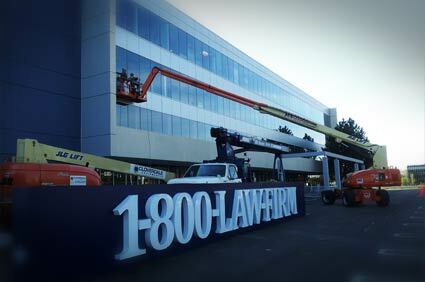 1-800-LAW-FIRM, PLLC is pleased to announce the relocation and expansion of its Southfield headquarters. The new 25,000 square foot offices, located at 26700 Lahser Road in the former Loan Giant Building, were needed to better accommodate the firm’s growing practice and its team of 40 attorneys and staff members and to provide easy highway access to its clients. The announcement was made by the firm’s founder and CEO, Ari Kresch. Particular design consideration was given to create both an employee-centric and client-friendly environment. Special features include a welcoming lobby with adjacent conference rooms of varying size, a fitness room with showers, private phone-chat areas and an office lounge. To flood the interior with natural light, high-efficiency windows and skylights were added. A hi- tech and professional, yet relaxed environment was created with color and lighting by Arik Green Design LLC of Ferndale, the firm commissioned to design these new offices. One of the most unique additions to the new offices is a walking conference track that allows employees to conduct meetings while they walk around the track which also encourages health and wellness in the firm. 1-800-LAW-FIRM PLLC focuses on pharmaceutical litigation, consumer protection, employment, labor law, accidents/injuries, Social Security claims, professional malpractice and whistle-blower cases. In addition 1-800-LAW-FIRM uses a network of nationwide lawyers to bring claims against companies. Founded in 1994, 1-800-LAW-FIRM is based in Southfield, Michigan and is a nationally recognized law firm whose founders have been representing victims across the country in medical malpractice, defective products and pharmaceutical litigation. Our goal is to expand our practice areas and provide clients easy access to experienced attorneys. Comprising a national network of the country’s top legal experts, the lawyers at 1-800-LAW-FIRM bring experience, knowledge, compassion, and commitment to every case and every client. We cover the entire spectrum of legal areas including accidents and injuries, bankruptcy, consumer protection, defective products, pharmaceuticals, employment/labor law, Social Security claims, professional malpractice, veterans’ claims, and whistle-blower cases. Call 1-800-LAW-FIRM or visit www.1800LAWFIRM.com and we’ll answer questions and concerns about your individual situation.